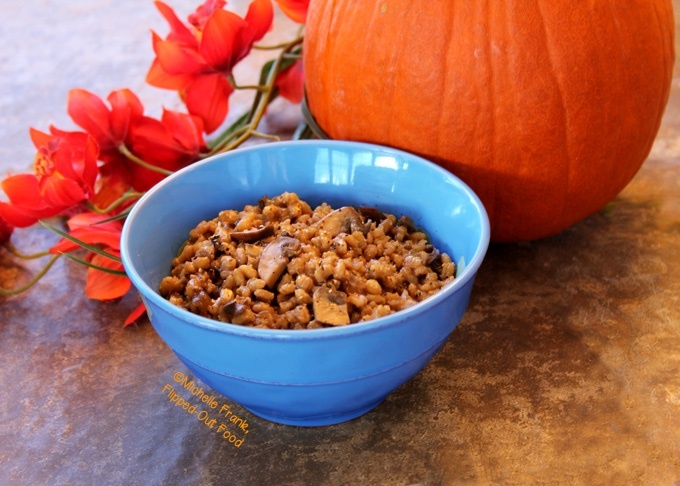 Double mushroom barley pilaf is a perfect vegan/vegetarian holiday side dish. It also pairs well with roast turkey, duck, and game hens. Double-Mushroom Barley Pilaf is a spin-off of a recent, extra-special meal I developed for Date Night. That meal, One-Pot Cornish Game Hens with Mushroom Barley Pilaf, is also perfect for small holiday dinner gatherings. Double-Mushroom Barley Pilaf is simply a stovetop version of that dish, made vegan and tweaked for cooking method. If you don’t like mushrooms, you likely will not be a fan of double-mushroom barley pilaf. Ditto barley. The flavor base of my Double-Mushroom Barley Pilaf begins with dried porcini mushrooms. If you can’t find dried porcinis, a good mix of dried mushrooms will do. To rehydrate, I boil about 4 cups of water, then add 1/2 cup or so of the mushrooms and turn off the heat. I let them soak for about 45 minutes. Then, I take out the mushrooms, discard any tough parts (like stems), and then give them a good rinse and a rough chop. Left behind in the pot is gorgeous, earthy mushroom tea. But there’s also grit, so it’s very important to strain the “tea” through paper toweling set into a strainer before adding it back to the pan. This sounds complicated, but it’s really not hard at all. Plus, you can do these steps the night before you plan to cook the pilaf. Simply store the rehydrated mushrooms and mushroom broth in the refrigerator. Double-mushroom barley pilaf is also flavored with fresh cremini mushrooms (a.k.a., baby portobello mushrooms). Finely chopped shallots, dried herbs, and S & P round out the flavor profile. To really kick the “mushroomy-ness” of this dish to the next level, I use a porcini-flavored oil. Truffle oil is another great (though expensive!) option. If you don’t have access to fancy oils like this, though, using extra virgin olive oil will still give you fantastic results. After sauteing the mushrooms and shallots in the porcini oil, I deglaze with a bit of white wine and use a wooden spoon to scrape up every bit of caramelized, browned bits that might be stuck to the pan. We’ve now set the stage for a richly flavored barley pilaf. 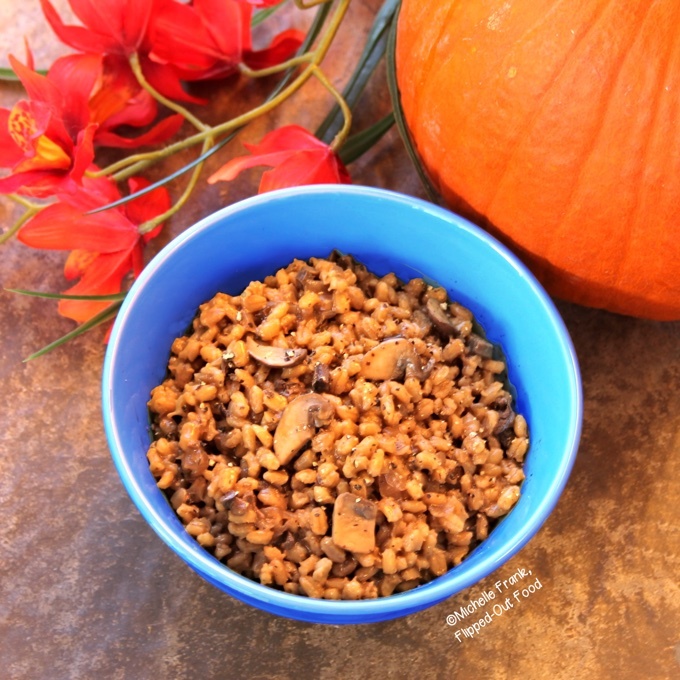 I prefer my barley to have a bit of texture or “toothiness.” For this reason, I use unsoaked pearl barley in my double-mushroom barley pilaf recipe. If you like your barley completely soft, you’ll want to soak it in advance, so plan ahead. I recommend soaking 1 part barley to 3 parts water at least 4 hours and up to overnight. I use a saucepan or skillet with a tight-fitting glass lid for this project. This enables me to monitor the simmering and liquid levels without having to disturb the barley by letting out steam. I don’t stir the barley pilaf at all until after about 50 minutes of gentle simmering. If you find that the liquid levels are getting too low, add 1/2 cup of liquid (vegetable broth is ideal, but water will work). The barley is done the way we like it after about 55 minutes of gentle simmering. If you choose to presoak your barley, start checking its texture after about 40 minutes. When the barley is just about done your liking, remove the lid and continue simmering until any extra liquid cooks off (a little bit of extra liquid is just fine). If I’m serving this barley pilaf to a vegan guest, I like to sprinkle it with some dairy free Romano or Parmesan cheese. If you have difficulty finding it, Nico from Yumsome has a quick, easy recipe for making your own vegan Parmesan cheese here. If it’s just us (most of the Franks are devout carnivores), I use regular Pecorino Romano. Either way, this final addition gives the double-mushroom barley pilaf a salty, nutty, umami kick that’s just fabulous. That’s it! The barley has to cook a long time, but most of it is hands-off. I’ve made the entire dish a day in advance and simply reheated it in the microwave: it was still fabulous! I hope your family enjoys this dish as much as we do. 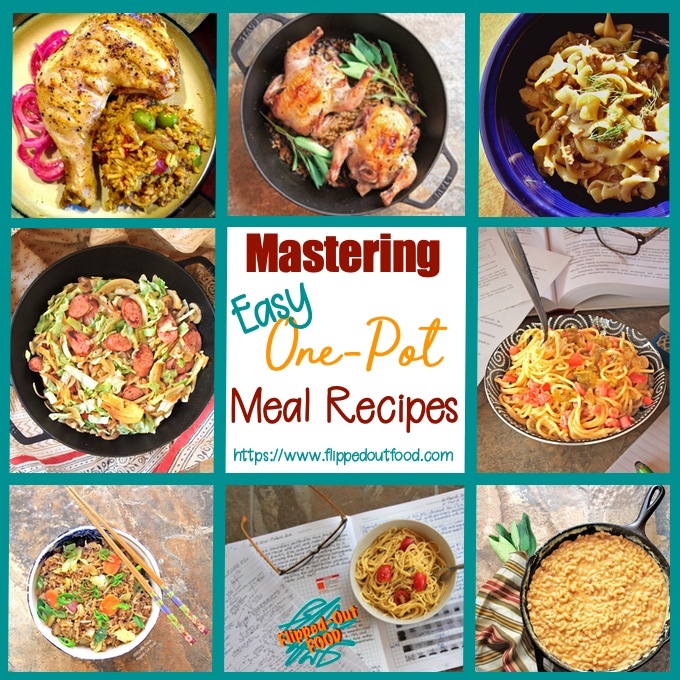 #CookBlogShare , a food blogger recipe-share hosted this week at Everyday Healthy Recipes. 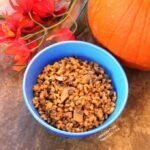 Double Mushroom Barley Pilaf is an easy vegetarian/vegan side dish that is perfect for holiday dinners. It also pairs brilliantly with roast turkey, duck, game hens, and more. Or, use it to stuff roasted acorn squash for a festive holiday main. Set a heavy-bottomed saucepan (preferably with a tight-fitting, glass lid) over medium heat and add the porcini oil (or truffle/olive oil). Add the shallots and fresh mushrooms; sauté until the vegetables have softened and the mushrooms have given up their liquid. Add the barley, rehydrated mushrooms, salt, pepper, and dried herbs. Sauté until the barley begins to smell toasty/nutty, 1–2 minutes (the barley will absorb the oil, which is fine). Bring the heat to high while stirring. Add the wine; stir and scrape the bottom of the saucepan with a wooden spoon until the wine has been almost completely absorbed/reduced. Stir in the vegetable broth and bring just to a boil. Cover and reduce heat to low (maintain a gentle simmer). Simmer, undisturbed, until liquid is absorbed and the barley is tender but "toothy" (al dente), 50–60 minutes. NOTE on soaked barley: if you opted to soak your barley overnight, start checking the texture at 40 minutes. When the barley is cooked to your liking, remove the lid and continue to simmer for ~5 minutes or until any remaining liquid is absorbed/evaporated. Fluff with a rice paddle or fork, sprinkle with cheese (if using), and serve. To rehydrate the mushrooms, bring 3 1/2 cups of water to a boil in a saucepan. Add the mushrooms, turn off the heat, and lid the saucepan. Let sit for 45 minutes. Remove the rehydrated mushrooms (reserve the liquid in the saucepan!). Rinse well, then pat dry with paper toweling before mincing. Strain the rehydrating liquid through a strainer lined with a layer of paper toweling. Keep this liquid to use for the vegetable broth. Don't use quick-cooking barley. This recipe is written so that the barley still has some texture/chew: if you prefer your barley completely soft, soak it at least 4 hours up to overnight in 3 cups of water. Drain and proceed with the recipe. If you're not trying to keep this recipe vegan, you can use regular Pecorino Romano or Parmesan cheese. WORK AHEAD: you can prepare the mushrooms and mushroom broth (rehydrating liquid) the night before. Store in airtight containers in the refrigerator. I love mushrooms and this looks full of flavour! Thanks for sharing at the What’s for Dinner party. Hope to see you again tomorrow.